Not my favorite question in Real Estate mostly because a lot of times it feels like people expect some sort of a short quip back, while you guessed it … it DEPENDS. Are you buying or selling? Are you trying to buy and sell at the same time? What type of property are you interested in? Which towns are of interest? Are you financing or buying with cash? I like to simplify things as much as possible while also falling back on concrete data, which is easily available through MLS database. MLS offers a number of custom reports we can generate to see the landscape of listings in your particular towns of interest. 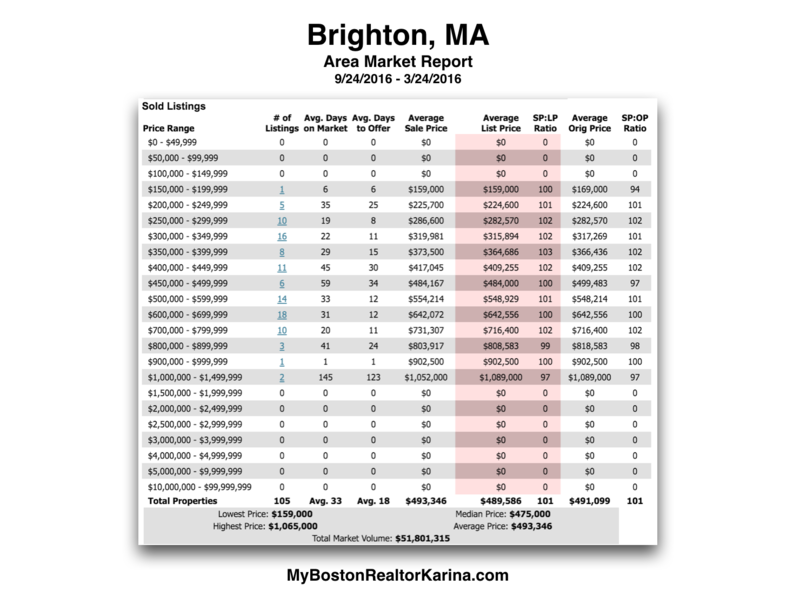 For example below is an “area market report” for Brighton that shows all sold listings for the past 6 months. It shoes you how many listings were in each price point, average days on the market, average sale price and average Sale Price (market price) over List Price (asking price). It’s one of the most useful reports to see the trends in the marketplace like whether buyers are paying over asking price or in which price point more properties competing for buyers and how many days on average are they spending on the market before getting under agreement. These types of reports can be customized for any town, any time period and are available through a real estate agent with MLS access on request.